Since it's Black Friday, I've decided to hope onto the bandwagon with a look at some fun wrestling rated products. If any of you are so moved to buy anything for me, my shirt size is XL. Just kidding. Hope you enjoy some of these things I found. 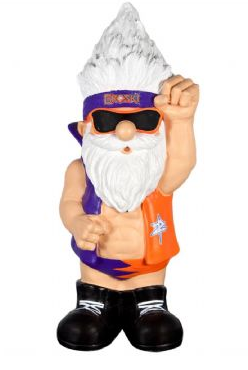 I love gnomes and I love wrestling. A natural fit, right? Of course. WWEShop now has seven different ones to chose from. John Cena, the Undertaker, Triple H (as the King of Kings), CM Punk, Stone Cold Steve Austin, Hornswoggle, and a fist pumping Zack Ryder. Of the ones offered, I like the Punk one the best. The Cena one is pretty neat too. I'm kind of surprised they didn't make a Rock one. The gnomes sell for $29.99 each. They're made of resin and stand about 11 and a half inches tall, and weigh a pound and a half. They're a little pricey, but I'd add one to my front yard just for kicks. 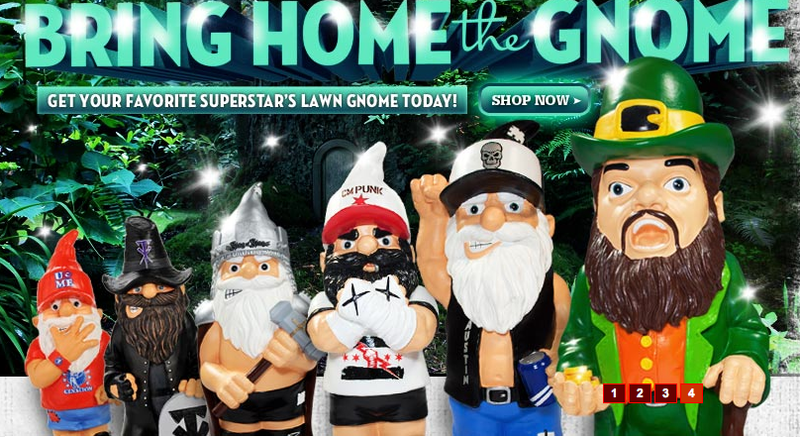 Punk could lecture my other gnomes about how he's the best in the yard. Typically I don't wear wrestling t shirts. I have nothing against them, in fact I own a couple, including a Captain Charisma one Chad gave me a while back. I also have a jersey from Wrestlemania 22 that I bought as a souvenir. But the tshirts I found on the Hirsute History website are really cool. I've never seen a design like this before, the silhouette of each star's head is just awesome. I like the yellow and red colors too. Very eye catching. But if those colors don't float your boat, don't worry, Hirsute offers a variety of colors. There's also a line of hoodies, fitted t's, and messenger bags. The tshirts are $15.99, not a bad price considering most WWE Shop tshirts are about 30 bucks. The hoodies are $35.99. 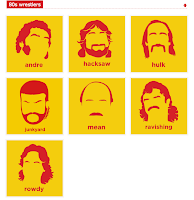 In addition to the 80's wrestlers, which include Andre the Giant, Hacksaw Duggan, Hulk Hogan, Junkyard Dog, Mean Gene, Rick Rude, and Roddy Piper; there are also musicians, scientists, presidents, and "commies". Earlier this year I started listening to the Colt Cabana podcast. It's an interesting listen, if you haven't heard it yet, I'd recommend it. Each week during the show, he talks about his website for merchandise, Colt Merch. One it, you'll find all kinds of cool items featuring "Boom Boom", but my favorite is the Stick Figure Wrestling tshirt. 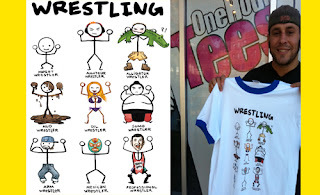 It shows you the different types of wrestlers, in stick form, leading up to professional wrestler with Colt's head on top of the stick figure body. Pretty cool. This shirt runs for $20, still not a bad price for a shirt. There's also a poster version for 10 bucks. Colt's site is pretty cool, and hats off to him for doing such a great job of marketing himself. By the way, I'm looking forward to meeting him at the AAPW Main Event show on January 14, 2012 in Marion, Illinois. When I was a kid I collected, well actually played with the LJN wrestling "dolls". In fact, I'm going to write a piece up on my collection at some point. As I got older, I switched to the Hasbro figures, but didn't play with them and left them on the card. Same deal with the Jakks figures. I don't have a whole lot, but I do have some. I now have my eyes on the new Kerry Von Erich/Texas Tornado figures by Mattel. Regular readers know I'm a Von Erich mark, and was a superfan of Kerry. I like the Mattel and Jakks action figures, because they get into more details of the wrestlers. They also are more movable and from a kid's perspective, they're easier to play with. But the old school in me loves the LJN figures too. I have not seen these figures on store shelves yet, and online they are selling for $29.99. Not prepared to pay that kind of price for an action figure. I'll keep looking at the stores. Bowling and wrestling aren't two things you'd think could go together, but there's a fan of everything I suppose. 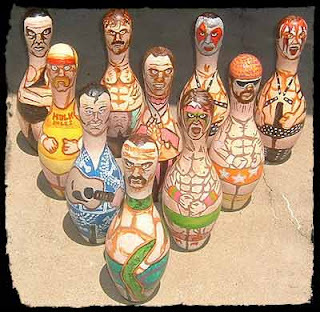 I came across these custom made bowling pins on the Wrestlecrap website. There's a section called "Someone Bought This" on the site and these pins are really unique. A fan made them, and judging from the characters used, I'm guessing it's circa 1988 or so. 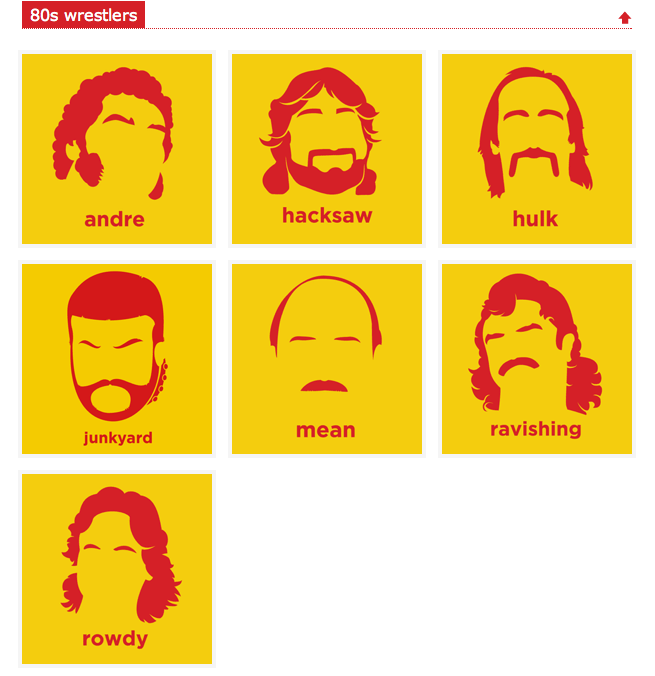 There's Hulk Hogan, Andre the Giant, the Ultimate Warrior, Demolition, Jake the Snake Roberts, Brutus Beefcake, Rick Rude, Honkytonk Man, and Randy Savage. A very cool collection, and the person who bought them paid $200. Obviously this is the tip of the iceberg for wrestling merch out there. These are just a few things that caught my eye this morning after coming up with the idea. What are some of your favorites? Post here or let us know on Facebook, Twitter, or YouTube.